Hugh Jackman Teasing Wolverine's Yellow Suit in Logan? Hugh Jackman is getting ready to hang up the claws as Wolverine, with the upcoming Logan set to be his last movie as the iconic mutant. Well, that is unless Ryan Reynolds can convince him to come back for a Deadpool and Wolverine crossover movie, but at the moment, that doesn't look like it is going to happen. For now, we have to assume that Logan will really be his last time. So, are we finally going to see the classic yellow Wolverine suit? It seems like Hugh Jackman may have just teased exactly that. The actor recently made a post to his official Twitter account, featuring a Wolverine action figure in the classic yellow suit from the X-Men comics. Hugh Jackman simply captioned the photo with "the original," and let fans do the rest. Given the very subtle way some things are teased these days, it seems very possible that this could be a sign that the suit could make an appearance in Logan. If it really is the last time we see his version of Wolverine on screen, that would be a fun thing to see and would serve as a great bit of fan service. Wolverine first appeared in Bryan Singer's X-Men back in 2000 and in that movie, the team suited up in mostly black leather suits. Cyclops even joked to Wolverine, "what would you prefer? Yellow spandex?" That has largely been the case in subsequent movies, but some characters have been seen in more classic versions of their costumes. In a deleted scene from The Wolverine, the yellow costume was seen in a box that was gifted to Logan, but the scene didn't make it into the movie. So could Logan finally be where the suit shows up? Maybe, but the setting seems a bit unlikely. Here is the official synopsis for Logan. "In the near future, a weary Logan cares for an ailing Professor X in a hide out on the Mexican border. But Logan's attempts to hide from the world and his legacy are up-ended when a young mutant arrives, being pursued by dark forces." In the second trailer for Logan, we saw the young mutant X-23, played by Dafne Keen, holding an X-Men comic book. Outside of that being a bit met and self-referential, it did provide some context that would make the yellow costume showing up in the movie less jarring and seemingly out of place. Since Logan takes place in a not-too-distant future in 2029 where most mutants have disappeared and the landscape is very bleak, a bright yellow superhero costume could throw things off quite a bit. Still, if they can find a way to slip it in and not make it seem forced, fans will certainly go absolutely crazy for it. 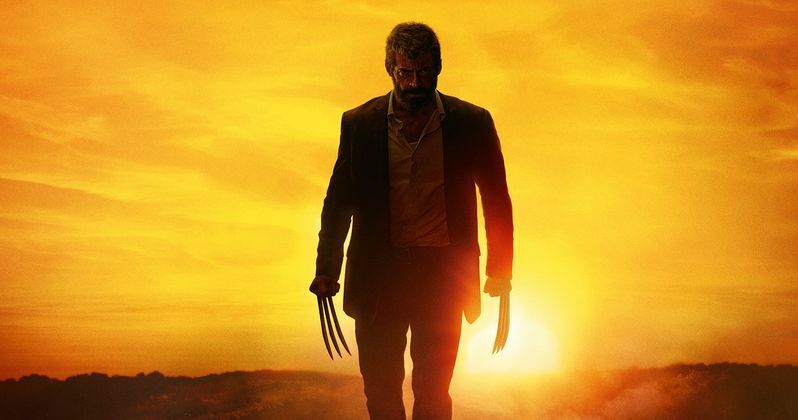 Logan stars Hugh Jackman, Boyd Holbrook, Dafne Keen, Stephen Merchant, Doris Morgado, Elizabeth Rodriguez, Richard E. Grant and Patrick Stewart. James Mangold is directing the movie, which is set for release on March 3, 2017. You can check out the photo and full Twitter post from Hugh Jackman for yourself below.